The less time you spend worrying about your IT, the more time you have to grow your business. Let us help you embrace Infrastructure as a Service (IaaS) with our custom, cost-saving solutions and services. Moving resources to the cloud can be challenging. Our cloud experts take a unique approach to help you achieve cloud readiness while minimizing downtime and security risks. By using hyperconverged infrastructure for their hybrid clouds, organizations are better equipped to address a variety of IT challenges. Get the most out of your hybrid cloud deployment with AWS managed services in a way that supports your workload and enhances efficiency. 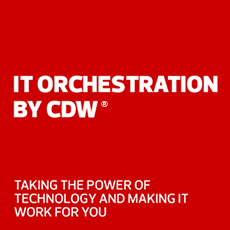 CDW offers end-to-end services for your cloud environment, including secure cloud migrations, managed IT services, cloud backup and recovery, and cloud virtualization. We help you migrate your applications and data without business interruption, ensuring your solution integrates into your existing and future infrastructure. Your dedicated cloud expert will guide you through the technical aspects of cloud infrastructure and help you find the right vendors and offerings for your needs — with plenty of advice from our networking, security and virtualization experts. Supplementing your in-house expertise, we can help you integrate your infrastructure and manage critical resources. We can also help you evaluate risk, assess and negotiate costs, and articulate ROI potential. We'll assess your infrastructure to select, deploy and integrate cloud solutions that are customizable and scalable. And we'll make sure your solutions evolve with your organization. We needed a disaster recovery environment that was best of breed to match the 99.99 percent uptime of our new Oracle ERP solution.